Thu., Nov. 17, 2016, 8:39 p.m.
AUSTIN, Texas – Three wins in seven days was just about the perfect start to the season for No. 23 Texas’ new starting lineup. The rest of the schedule promises to be much more challenging. And it starts right away, far away from the comforts of home. Tevin Mack scored 19 points and Texas rolled to an easy 85-52 victory over Eastern Washington on Thursday night as the Longhorns started smoothing out the rough edges in their 3-0 start. They will know next week when they travel to Brooklyn, New York for the Legends Classic, where their first opponent will be Northwestern. That’s a far different feeling than last season, when Texas started 2-3 after early road trips to China and the Bahamas. Texas had little trouble with Eastern Washington as five Longhorns scored in double figures. Freshman Andrew Jones scored 17 points on 6-of-10 shooting. He had a big first half, making all four of his shots for 12 points in just 9 minutes on the court. Yancy scored 10 points, opening the game with consecutive 3-pointers, and Texas built a 39-24 lead at halftime. Jarrett Allen, Texas’ 6-foot-11 freshman forward, had four assists in the half by kicking passes out to wide open shooters for 3-pointers. Texas opened the second half with a burst from Eric Davis Jr., who made two 3-pointers in 10-4 run that pushed the lead to 54-28. Jones’ first basket of the second half, a breakaway dunk, put the Longhorns up by 27 with 11 minutes to play. Bogdan Bliznyuk scored 22 points for Eastern Washington (1-2). Eastern Washington: The Eagles were overmatched from the start against their first Big 12 opponent in six seasons. Eastern Washington is 1-24 all-time against ranked opponents. 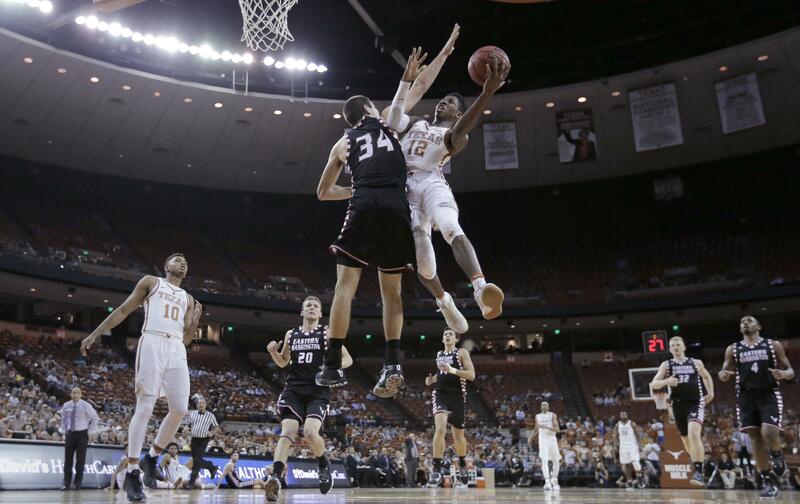 Texas: The Longhorns played their most fluid game with unselfish passes, defensive hustle and an ability to spread the points around the court. Kerwin Roach Jr., who missed the first game because of a suspension, got in his best work at point guard with four assists. Teh Longhorns still need a win against major conference competition if they hope to impress voters. The next two games against Northwestern and either Notre Dame or Colorado at the Legends Classic, would be a start. Mack was suspended for the first game for an offseason rules violation but has lead the team in scoring in each of the two games he’s played, despite not starting either one. He scored 14 points in 23 minutes against Louisiana Monroe, and played just 21 minutes against Eastern Washington. He has a team-high eight 3-pointers on 14 attempts. Texas made a season-high 11 3-pointers and Eastern Washington was just 3 of 21 from long range and made just one in the second half. Two of Allen’s early assists led to Texas 3-pointers. “I thought Jarrett really set a tone early in the game by making some terrific passes,” Smart said. The Longhorns forced a season-high 16 turnovers. Published: Nov. 17, 2016, 8:39 p.m.